Cover page, including your name, address, preferred email and phone number. Introduction/Bio: Introduce yourself and tell us about your experiences as a reader and writer of poetry, and anything you think might be relevant to your poetical experience, be it work, education, travel, publication; no more than one (1) page. Writing sample: five (5) of your strongest, most representative poems. No more than one (1) poem to a page, no more than 10 pages total. Residency Proposal: What are your goals for the residency? How do you plan to promote poetry (your work and the work of others) during the residency? How would you like to help grow the poetic community in the Quad Cities and surrounding areas? Limit proposal to 2 pages, double-spaced. Your availability for September-November 2019, with as much detail as possible. Resident must participate in/host at least 2 readings (at least 1 in Illinois, 1 in Iowa), visit at least 2 schools (at least 1 in Illinois, 1 in Iowa), conduct at least one poetry workshop, edit/curate a poetry blog during the residency at communitybasedpoetry.blogspot.com, and launch a limited-edition broadside of a single poem, to be published by MWC Press. Rock Island, IL 61201 Include SASE for notification. Manuscripts will be recycled at the conclusion of the residency; please save a copy for your records.To apply via email—Send application in a single file attachment to mwc@midwestwritingcenter.org (accepted formats: .doc, .docx, .pdf, .otd, .rtf). The subject line should read as follows: “Application for 2019 Collins Poetry Residency”Please contact Ryan Collins at the MWC if you have any questions about the application process. 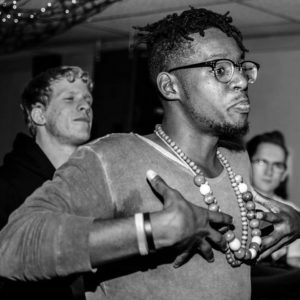 Aubrey Barnes of Rock Island, IL will serve as the resident poet at MWC throughout the fall of 2017 and will facilitate a series of events, including an open mic, a poetry workshop, a featured reading and hosting a community poetry reading, and curating an online poetry journal. Through the residency, Barnes will encourage community-based poets who are developing their craft outside of a formal academic setting, and provide a forum to showcase their work through the residency’s online poetry journal and a public reading of their poems. Holly Norton of Davenport, IA will serve as the resident poet at MWC throughout the fall of 2015 and will facilitate a series of events including a featured reading, area poetry workshops and school visits, hosting a community poetry reading, and curating an online poetry journal. Through the residency, Norton will encourage community-based poets who are developing their craft outside of a formal academic setting, and to provide a forum to showcase their work through the residency’s online poetry journal and a public reading of their poems. Norton’s focus for her residency will center on the intersections of art, music, and poetry, and how these different mediums can inform and inspire each other. Many of her programs and events will address and encourage these intersections throughout the fall. MWC published a limited-edition letterpress broadside of one of Norton’s poems, which is available for purchase at the MWC. Holly Norton is a visual artist, creative writer, and poet. Her impetuous youth, coupled with traveling, reflect in her writing as a microscopic observation of humanity and its tendency to allow the small to influence and destroy. Her evaluation of minutia is a commentary on the unavoidable encumbrance to our human condition while giving high praise to the inane. Norton’s writing is a labyrinth of image, confession, and confrontation that often remains joyous in bleak landscapes. She lives by the Mississippi River in the Quad Cities with her three children and her head in the clouds. 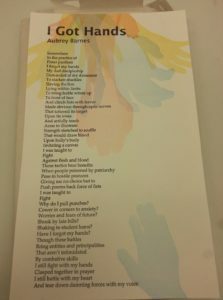 Aubrey Ryan’s poems have appeared in Best New Poets, Anti-, Phantom Limb, Quarterly West, Squat Birth Journal, DIAGRAM, Cellpoems, Pebble Lake Review, and elsewhere. 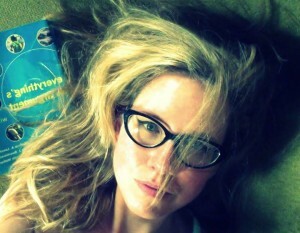 She is the winner of a Tupelo Press Poetry Project award, and the 2012 Booth Poetry Award. Aubrey is poetry editor at Sundog Lit and runs a (very) fledgeling broadside press. She lives in Iowa with her sweet husband and sweet kid. 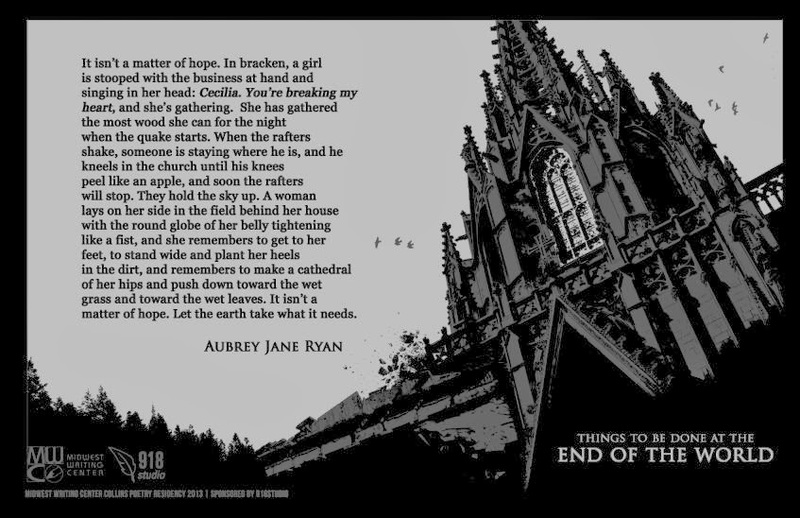 Buy Alexander Iaccarino’s Broadside of 2013 Poet-in-Residence Aubrey Jane Ryan’s Poem “Things To Be Done At The End Of The World” – Use PayPal button below. The Collins Poetry Residency is established in honor of the Richard Collins family and their contributions to and encouragement of poets and poetry in the Iowa/Illinois Quad Cities and the Upper Mississippi River Valley. The residency supports community-based poetry and a regional poet who has not yet published a full-length poetry collection and who resides in the six-county Quad City area (Rock Island, Henry, Mercer in Illinois; Scott, Clinton, and Muscatine in Iowa). The biannual Collins Poetry Residency is coordinated by Midwest Writing Center.